When it is played in Canada, there are twice as many Canadian participants. This is because when play is in the U.S.A., there are not as many curling clubs to accommodate the curlers as there are in the Montreal area. Curling clubs began springing up in the mid-1880's in both Canada and the United States and it was natural that international contests would soon follow. On January 25th, 1884, Mr. Robert Gordon of New York City presented a handsome gold medal to the curlers of the United States and Canada to be played for in annual competition. Mr. Robert Gordon was a member of the St. Andrews Curling Club of New York and was the first patron of the Grand National Curling Club of America, retaining that honor until his return to Scotland in the summer of 1884. He was born in Dumfries, Scotland, November 17, 1829, and educated in Scottish schools and Glascow University. In 1849, when he was 20 years of age, he came to New York and was connected in business with the firm of Maitland Phelps & Co., a financial house. Mr. Gordon retired from business in April of 1900, and he died at Christchurch in 1918 at the age of 89. Robert Gordon of New York City was elected the first patron of the Grand National at its inception in 1867. Through the Grand National, Mr Gordon had presented "The Gordon Champion Rink" medal to the curlers of the United States in 1869. Then on January 25 1884, Mr. Gordon gave "...... the Gordon International Curling Medal ..... to the curlers of the United States and Canada ...... to be played for at Montreal and the United States alternately under the direction of the officers of the Canadian Branch of the Royal Caledonia Curling Club. 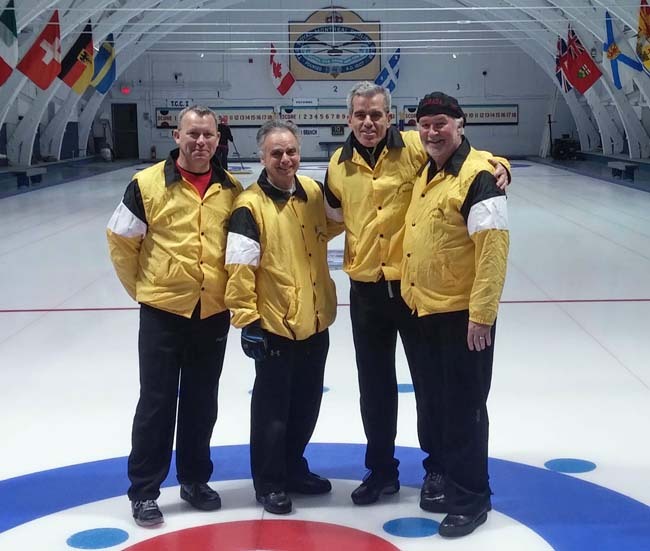 The first match for the Medal was played at Montreal on February 8, 1884 and was won by the Milwaukee Curling Club. Terms of the original rules governing the Match established Montreal as the venue of play, and the Canadian Branch of the RCCC as the governing authority. It was originally intended to hold the matches at the same time as the Montreal Carnivals on the ice on the St. Lawrence River. However, these did not last long: so in 1889, as a result of a request made jointly to the Canadian Branch by the Donor of the Medal and the GNCC, it was mutually agreed to have the Match alternate between Canada and the United States. The first match in the United States was at the "fine new covered rink" of the Albany City Curling Club on February 20, 1890. Records indicate that over the 119 year period, matches were postponed due to smallpox epidemics in 1885, 1886, and 1887; due to lack of ice in 1897, 1898, and 1902; and due to Wars in 1916, 1917, 1918 and again in 1945. The winner is decided by whichever country has the highest total rock count. It appears that for the inaugural games and for some years thereafter the games were 21 ends, but has now settled down to 10 end matches. 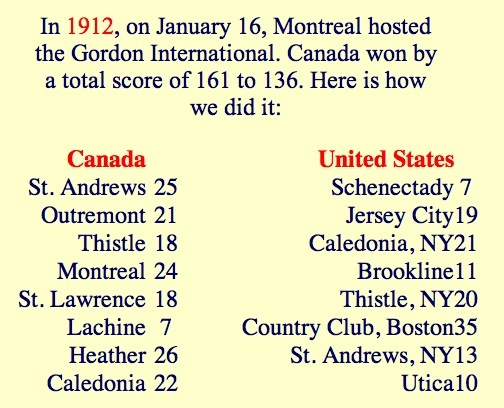 In honour of Canada's 100th birthday, the Grand National Curling Club presented "The Gordon International Bowl" to be awarded each year for the highest plus single score on either side during the Gordon International Medal matches. In 1975, at the request of the Grand National, its name was changed to "The Add Hastings International Bowl". Mr. Hastings was the original donor of this trophy. He was a member of the Ardsley Curling Club and President of the Grand National Curling Club of America (1949-1951). As to the composition of the Branch and Gordon teams, this is determined by the Branch. The Gordon has been conducted under the direction of the officers of the Branch since 1884 and they have conducted this annual event very successfully. 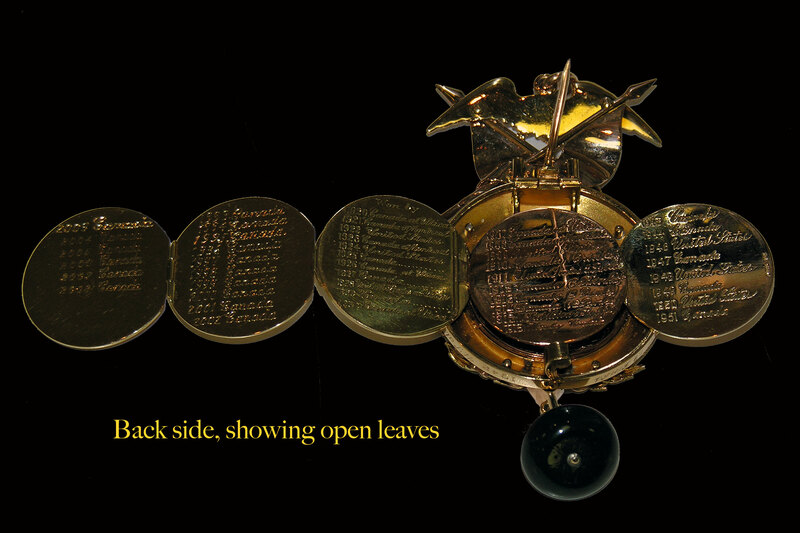 Until 1901, the Match was played with two rinks on a side, then by agreement, the rule was changed to provide for the Medal to be played for by two or more rinks on each side - the number being arrived at by agreement each year. Today, when the medal is played for in the United States, there are 20 Canadian teams and 20 American teams each playing two ten-end games. The outcome is determined by the total number of stones scored by each country in the two games. There are two other competitions within the Gordon International. The J.C. Stevens Memorial Shield has been presented since 1988 to the point-total winner of the Friendly games. 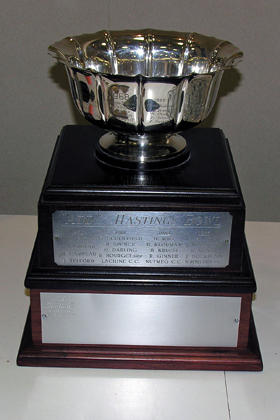 The Add Hastings International Bowl has been awarded since 1968 to the rink on either side that has the largest plus score in any single Gordon game. This history has been assembled from information provided by Utica's Tom Garber at the 1998 Gordon Competition. Some text was written by Hu Whitehead, Pointe Claire Curling Club Historian. More recent information has been provided by Allan Rowell.